For beginners, the student focuses on four lessons such as color mixing, texture, balance and composition, shading and drawing with a final canvas on Still Life painting and for the advance same lessons but with application of textured mediums. This module focuses more on interior design and how to use perspective to properly draw furniture in rooms. The students will learn how to use t-squares and scales so they will be able to use exact measurements when drawing the height, width and length of their furniture. 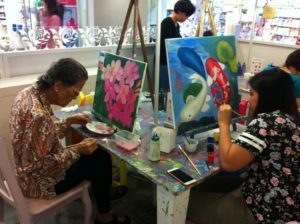 They will also learn how to draw the exterior of cafes, different buildings and other outside lcoations and use the coloring, painting and linking techniques they learned in the previous module to bring their rooms to life as well as learn how to draw the human figure into their backgrounds. 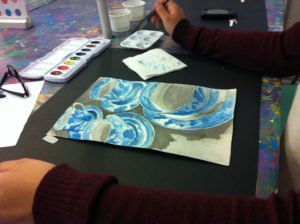 For beginners, the student focuses on the basic washes.